Most advertisers know that the best way to increase sales and profit margins is with consistent branding across multiple media, and the very best marketers take it to the next level by utilizing all of their available advertising space. They make use of every inch and create a marketing canvas wherever they can. 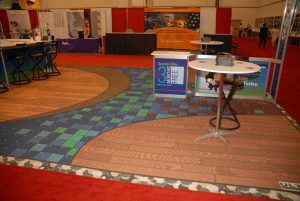 In fact, they often start at the bottom and work their way up with branded carpet graphics from Ultraflex Systems, Inc.
For truly vivid carpet graphics, you need a product that is built to stand the test of time. UltraCarpet® Extra is our one-of-a-kind, white, tufted-pile carpet that is made specifically for solvent, eco-solvent, UV, screen and Latex printing. There is minimal drying time required. The ink will not scratch off, even after prolonged use or when used in high-traffic areas. The carpet has been engineered for indoor, digital print, but it can also be temporarily used in outdoor settings. Product is ideal for carpet and doormat applications. As a world-renowned banner, canvas, backlit, blockout and flooring media supplier, you can trust and rely on Ultraflex Systems, Inc. to deliver top-quality products for all of your marketing and advertising campaigns. We are constantly bringing new products to market each and every year, and our five North American locations allow us to keep large quantities of all of your favorite products in stock. If you are an advertiser or printer looking for materials to create the ideal carpet graphics in the USA, England, Scotland, Mexico, Canada or elsewhere worldwide, turn to the experts at Ultraflex Systems, Inc. We are the leading flooring media supplier and are known as an innovator in printable media and specialty substrates. Contact us today for more information about any of our products or to place an order. We look forward to serving you!